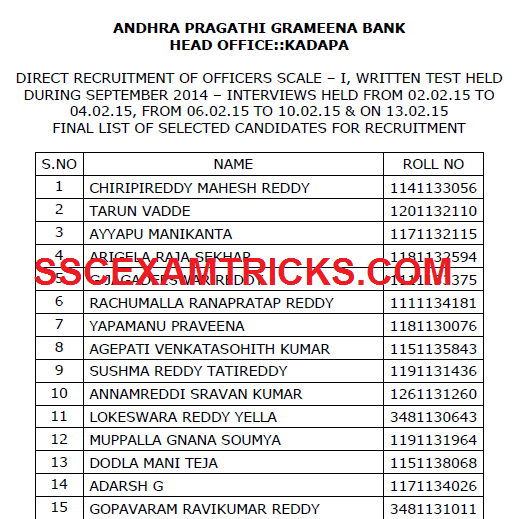 Andhra Pragathi Grameena Bank (APGB) has released Final Result of Officer Scale I on the official website for which interview was conducted on interviews held from 02.02.15 to 04.02.15, from 06.02.15 to 10.02.15 & on 13.02.15 at Andhra Pragathi Grameena Bank, Head Office, Opp.Officers’ Club, Near Murali Theater, Rayachoty Road, Kadapa – 516001, Andhra Pradesh. Earlier APG Bank had released notification for the posts of Officer Scale I and II based on the performance in IBPS RRB CWE III held in the month of September/October 2014. Those candidates who had attended interview can download their Final Result from the direct link provided in the end of the posts. The Finally Selected Candidates for the posts of Officer Scale I should bring and deposit the list of document which is provided below at the time of receiving appointment letter from the authority. The appointment Letter will contain the date of joining and reporting time along with venue of appointment. The candidate will have to report at the venue mentioned in the appointment letter on the fixed date. · Photo identity proof like Pan Card, Voter Card ID etc. · Address proof i.e. Ration Card, Aadhar Card, Voter card or Driving License. · Caste/PWD/EXS certificate to claim for seat available for reserve category.